I cracked. After three days of being bottle free, I gave Theo a bottle. Totally moving backward, I know. I need a new strategy. 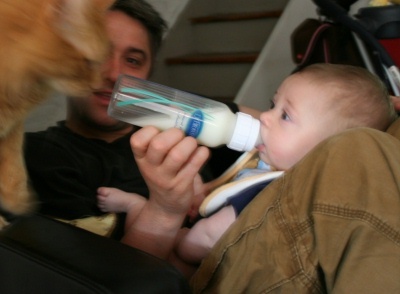 How crazy is it that it really wasn�t that long ago that we really, really, really wanted him to take the bottle? This picture is from May 2007. Awww. What a peanut! No hair!